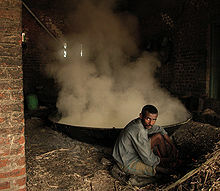 Boiling the sugarcane juice, large scale Jaggery (Gur) making in India. Transferring boiled sugarcane juice into vessel to dry, jaggery (gur) production on a large scale is a common sight in India. Gud or jaggery: Sugarcane derived raw sugar crystallised cubes or blocks. Jaggery blocks also known as "gud". "Gur mamra" laddu sweets made from jaggery and puffed rice.